With my background in SEO, I check out pretty much any new service comes out that promises to help your rankings in Google or the other search engines. 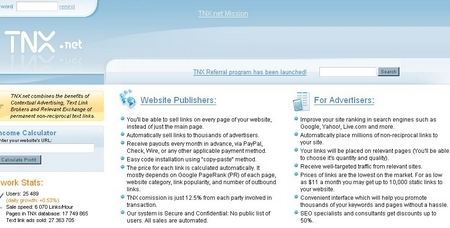 So when I started seeing reviews and ads for TNX.net, it intrigued me not so much as a new way to monetize a site, but as another place I could potentially buy links. Google’s war on paid links has gotten quite a bit of press but what hasn’t been so well publicized is their reason for waging the war. That reason is, quite simply, because paid links work. Knowing that, the fact that TNX.net provides me one more place to buy links was what grabbed my attention. However, there’s also the potential to make money online with this service so I figured I should probably check it out and share my experiences with you. As I said, I was naturally drawn to the “advertise” side of the site first and when I discovered that I could get 2,000 points credited to my account (free points = free links) by just posting to a Digital Point thread (I was already a member there) I figure what the heck. I signed up, replied in the thread, and about a day or so later my account was credited. I expected to just put a couple of keywords and phrases into a list and have it crank out links somewhere but you actually have to create short sentences or fragments so that there’s text surrounding the link which is actually a pretty smart thing although a bit annoying to set up. I mean how many different ways can you say “make money blogging” you know? One other thing I didn’t like was the amount of time it took to have my campaign approved. It took a couple of business days and I’m not sure whether it’s my ADD or what but it just seems like it should be a bit quicker. Anyway I started a test of the advertiser side of things but as with all things SEO, that will take a while to see the results. One positive note is that unlike some of the text link sales sites that are out there now, you sell links on each individual page rather than your site as a whole. The value that TNX places on each link “depends on Google PageRank (PR) of each page, website category, link popularity, and number of outbound links.” While that answer is about as clear as mud, they do offer an income calculator. Unfortunately, you have to do the whole thing manually which if your site is very large at all, can be a real pain. Plus, the system relies on Google PageRank. Now, correct me if I’m wrong but wouldn’t a site that is centered around selling links realize that Google has been playing games with PageRank recently? Maybe I’m being overly optimistic but I can’t wait for the link selling sites to stop relying on PR to value links. Whether they use Technorati authority or some other measure it’s time we stop relying on Google, an entity which would love to wipe out the link market, for our valuation tools! Anyway, back to TNX. Of course, no online service would be complete these days without an affiliate program to go along with it. In this day and age affiliate programs are all the rage and having a good one can make or break your company. TNX’s program pays out 13.3% of your referrals’ earnings which is actually more than the 12.5% commission they take. Also, by rewarding points rather than cash, they’ve been able to eliminate the minimum payout. There is a minimum payout of $5.00 when you sell points though so keep that in mind. So there you have it, the three parts of the TNX.net system. There are certainly several promising aspects to the program but the whole thing seems to be unnecessarily complicated. Setting up a link purchasing campaign is not what I would consider easy, the line from selling links to making money is indirect at best, and there simply isn’t enough information on the site. They mention that the value of TNX points is increasing by 2% every week but they don’t explain why. They provide you an income calculator but force you to do it all by hand. They also state that “In addition to all of the above, your website will not brake(sic) rules of any search engine including Google.” As ridiculous as I think Google’s policy is on paid links, that statement is simply false. Google has plainly stated that buying or selling links that pass page rank is against their terms of service. Don’t get me wrong, as I said earlier there are several aspects of this program that I have high hopes for. The low commission rate looks VERY promising, and the more links I can buy the better. Overall, if I were grading TNX I think I’d give it a C. It’s certainly not all bad but there is definitely room for improvement. I’ve been hearing about TNX quite a lot these days. One advice to them is to just scrap the points system and get it straight to the money. It sounds more professional and is much less complicated. You should definitely check it out before spending any money with them. I didn’t like TNX from the start. They emailed me a week after they launched asking for a advertising spot. I told them my price (which was really low compared to most other sites). They toyed with me for about 3-4 emails and got me to sign up. Once I signed up they dropped all communication. It was a joke. I got the same email from TNX but did the review for free. I have since added TNX to my site and I have to say the results are nothing short of amazing! You need to understand something, I have a lot of PR5 pages on my site and each one gets me about 6K points per link (max of 4 per page). Hey Ben, if you need to buy some points let me know, I’ve got a boatload of them! TNX does let you buy them at a discount but i think you need to spend $250 or more to get the discount. I’ll sell mine to you for less than the going TNX (non-discount) rate but higher than the TNX buy back rate. Yeah, I’m seeing some evidence that Google may have already discounted TNX links but I need to do a bit more searching around before I post anything about it. If that’s the case I’d drop my grade from a C to an F.
Does anyone remember the rankings they used to brag about on their site? I can’t seem to find them anymore and I’m pretty sure it’s because they aren’t ranking anymore. If you are to buy or sell links, TNX is much better than linkworth and TLA. I have tried all systems and looks like TNX is the best. I would not trust this TNX thingy for a minute. No means of contact on their site. No phone #, no email.